In 27 short years artist Jean-Michel Basquiat has left a legacy far from the same-old same-old. Learn more about the artist’s life and career with 10 facts that might surprise you before you come see the one-work exhibition Basquiat—Untitled at the Seattle Art Museum, on view for the first time on the West Coast through August 13. 1. At the start of his meteoric rise to art stardom, Basquiat was a graffiti artist. Strategically spray painting near hot artist hubs, museums, and galleries—Basquiat and his friend Al Diaz graffitied NYC under the pseudonym “Samo©” which stood for same old sh*t.
2. With exhibitions around the globe 30 years after his death, it’s hard to believe that both the Whitney Museum of American Art and the Museum of Modern Art rejected Basquiat’s work. Collectors Lenore and Herbert Schorr offered to donate Basquiats to both institutions in the 1980s but they declined. 3. Aside from painting and drawing, Basquiat was also a musician. He started the industrial sound band, Gray, and produced a hip-hop track called “Beat-Bop” featuring artist Rammellzee and rapper K-Rob. Original vinyl of this track featuring artwork by Basquiat sells for thousands of dollars and it’s named one of the most valuable hip-hop records of all time. 4. Basquiat hung out with a lot of celebrities, including pop artist Andy Warhol. Though some questioned the integrity of the friendship between this seemingly unlikely pair, Warhol and Basquiat were close friends and collaborated on a plethora of works and projects until they had a falling out. 5. Growing up in Brooklyn with a Puerto Rican mother and a Haitian father Basquiat was trilingual and spoke English, Spanish, and Haitian Creole. 6. Bought at a whopping $110.5 million dollars by Japanese art collector Yusaku Maezawa, Basquiat’s painting Untitled broke the record for the most expensive American artwork ever auctioned. 7. For a period of time while Basquiat was homeless he was able to support himself by dealing drugs and selling postcards and clothing with his art on it. 8. A man of many talents, Basquiat also starred in the 1980s movie Downtown 81 also known as New York Beat Movie. Due to financial reasons, the film was abandoned in the mid-80s only to be released in 2000 at the Cannes Film Festival. 9. Basquiat dated Madonna in 1982 when she was still an aspiring entertainer. In an interview Madonna said that after they broke up he asked for all the paintings he gifted her back then painted them black. 10.Blondie fans you may have seen a familiar face in the “Rapture” music video. In addition to Basquiat making a cameo in their music video, Debbie Harry and Chris Stein bought his first painting for $200. 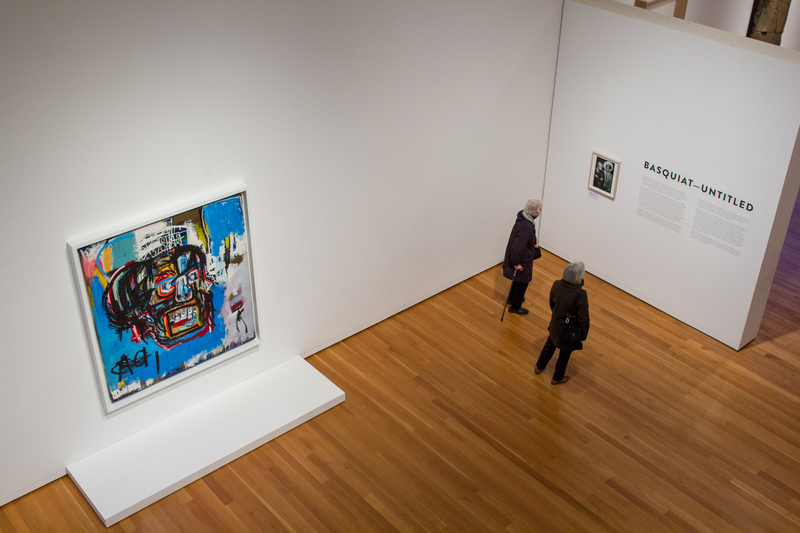 Image: installation view Basquiat—Untitled at Seattle Art Museum, 2018, photo: Natali Wiseman.